While some of the features have trickled down from the 24MP A9, the speed gains over its predecessor are from the same “front-end LSI” preprocessor found on the A7R III. Video capture also benefits, with the cinematic 24p and 30p 4K (UHD) downsampled from the full width of the sensor — effectively a 1.2x crop. Unsurprisingly, the A7 III body shares the some of the conveniences and ergonomics of those two earlier body designs, including dual SD slots, a larger Z-type battery, touchscreen control, and a larger hand grip. 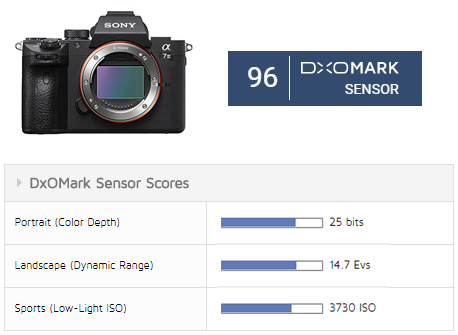 The Sony A7 III achieves an overall DxOMark sensor score of 96 points and ranks in the top five best Sony sensors we’ve tested, just behind the full-frame Sony Cyber-shot DSC-RX1R II fixed-lens compact camera, and the Sony A7R II. A fourth-place finish among Sony sensors puts it ahead of the high-end a9, which features a similar 24MP sensor and comes in at 92 points. The A7 III delivers its best image quality at its base sensitivity of ISO 50, where it achieves very good color depth of 25 bits and a dynamic range of 14.7 EV. Both of those measurements are very good, but the highlight is the low-light score, which at 3730 ISO is the highest of any full-frame 35mm sensor we’ve tested. Recall that this is the highest ISO sensitivity that meets our strict image quality criteria of at least 18-bit color, a minimum dynamic range of 9 EV, and a signal-to-noise ratio (SNR) of 30 decibels. These scores are based on unprocessed RAW files, but means that processed JPEGs at ISO 3600 and ISO 6400 should be well within the camera’s capabilities. 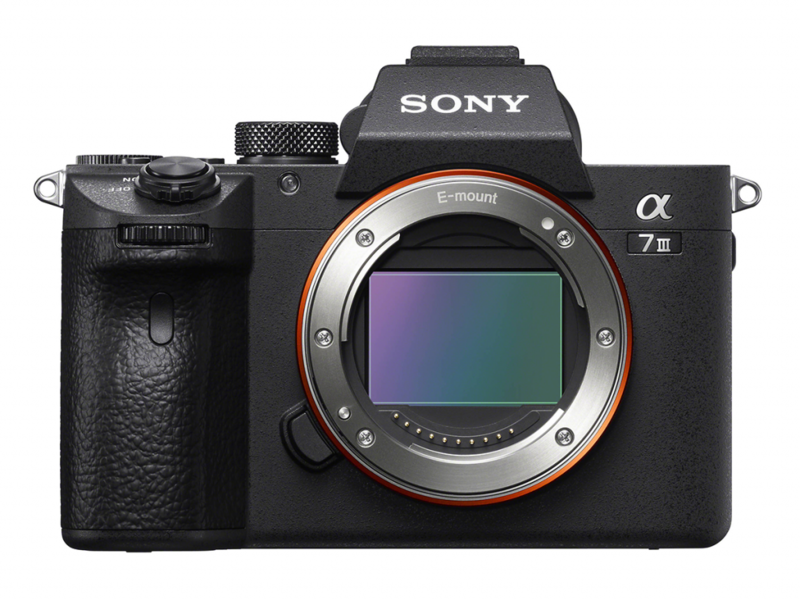 Sony promotes the three A7 models for specific purposes: the 42MP A7R III is oriented towards landscape and commercial photography, or any other photo genres that require high resolution, whereas the 12MP A7S II has some advanced video capabilities, and with its much larger pixels, is more likely to appeal to those working in low-light. Featuring a 24MP sensor, the A7 III falls somewhere between the two, while having sensor resolution and image quality similar to the a9. The Landscape (dynamic range) sub-score of 14.7 EV is a modest 1.4 EV wider than that of the A7S II, and matches that of the A7R III, making the A7 III an attractive option for a wide range of use cases, including those that include bright highlights and deep shadows. It is of course highly suited for action and low-light scenes. The Sports (low-light ISO) score of 3730 is the highest we’ve seen, just ahead of the first-generation A7s, which were our previous best low-light performers, and is ahead of of both the A7R III and the second-generation A7s II. The A7 III drops a couple of places in our Sony sensor rankings for its Portrait (color) score, with a color depth of 25 bits at base — behind the A7R III, but around a two-stop advantage over the Sony A7S II at 23.6 bits. At higher sensitivities, though, it does not maintain those gains, of course, with all three performing similarly above ISO 3200, including a slight reversal of fortune for the A7S II, which performs marginally above the others (in terms of dynamic range at least). So while that is an advantage, in practical terms the difference isn’t huge. Our in-depth analysis takes a closer look at the Sony A7 III compared to one of the highest-scoring full-frame sensors, found in the Nikon D850, as well as against the Canon EOS 5D Mark IV. All cameras perform best at their respective base ISOs, and it’s here that you often find the most discrepancies among rivals, in part due to the difference in measured base. Like its predecessor, the Nikon D850 has one of the lowest base ISO speeds of any camera — measured at just ISO 44 — and achieves class-leading metrics as a result. Although a direct rival of the A7R III, the D850 has a color depth of 26.4 bits, which offers a modest advantage of around a stop over the Sony A7 III and the Canon EOS 5D Mark IV, which, intriguingly, are both pitched more towards a similar market. When used at base, the Nikon offers better and more nuanced color discrimination, but it’s unlikely to be noticeable in all but the most complex of color transitions in images. As ISO sensitivity increases, color sensitivity decreases slowly at first, and then more rapidly, particularly with the Nikon and Sony sensors. At around ISO 800, the Nikon D850 matches the response of the Sony A7 III, and even though the Canon EOS 5D Mark IV is fractionally behind, in practical terms all three perform similarly. As you might expect, the Nikon D850 sensor has an impressive dynamic range of nearly 15 EV, but even without that models lower base, the Sony A7 III is practically identical (14.81 vs. 14.65 EV). The Canon sensor performs very well, too, but at 13.6 EV, it is around a stop behind its rivals when measured at its lowest ISO sensitivity. The lead is quickly curtailed, though, and at ISO 200, the Canon sensor’s dynamic range is just 0.3 EV less (and thus effectively the same). If it weren’t for a slight increase for the A7 III between ISO 800 and ISO 1600, there wouldn’t have been much more to report. The bump accounts for around a 2/3-stop advantage at ISO 6400 (manufacturer rating) at our 10 EV quality threshold, and continues thereafter up to IS0 51200 (with another bump above that), meaning that the Sony sensor has likely been fine-tuned for an improved response in low light. Noise levels have always been low on the A7, and so it is with the Sony A7 III. The SNR 18% graph shows a higher signal-to-noise result for the D850 at base, but at 32 dB at ISO 3200 (manufacturer rating) shows that in low-light and at high ISO settings, the A7 III has very well-managed noise levels just a tad above a half-stop over the D850, and around a quarter-stop over the Canon EOS 5D Mark IV. The SNR 18% results are excellent for all three models, especially given the additional pixel count of the Canon EOS 5D Mark IV and the Nikon D850, but in our Sports (low-light ISO) benchmark, the sensor in the A7 III not only maintains its lead in this comparison, but has the lowest noise levels we’ve ever seen in a full-frame 35 mm (135) sensor. In this review we have compared the Sony A7 III to its most direct rivals that we’ve tested. As usual, you can create your own comparisons and in-depth analyses using our interactive image sensor ranking tool.